We love our Village People, because let’s face it – there is no village community without them. We are constantly sourcing feedback from our residents, encouraging them to communicate with us informally and holding regular ‘Resident Forums and Meetings’. We take these communications seriously and through this we continue to make our community and environment special. The following are testimonials from some of our current residents. Life at Palmview Village can be summarized in two words, choices and security. Choices in how often you wish to participate in the activities of the village and these are varied. Exercising in the swimming pool, relaxing on the indoor bowls green, golf, or walking around the Gooseponds park that is the front door to the village. Security in the sense of providing safety and privacy, with the knowledge that assistance is as far away as a telephone call or a call on your neighbour. Security of financial investment that once your original lease is formulated one knows exactly that those terms will not alter and more importantly to us ageing population security of “lifestyle”. With regard to the finances of the village, we have found that the costs are considerably below what other retirement villages charge. In addition the management and owners providing a superior service to the residents. We have never regretted our decision to move to Palmview Village. We enjoy the friendly, warm atmosphere here, and although we participate in village activities, we pursue our normal life outside as well. Palmview is very well situated,being close to shops, medical facilities and the city centre. We appreciate that Palmview is locally owned and managed,and the office staff are always pleasant and helpful. There are a wide range of activities here to suit everyone, such as tai-chi, a choral group, a golfing group, bridge and bowls. 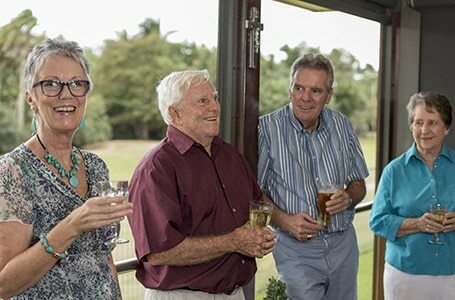 We have a very active social committee who arrange interesting evenings and daytime activities. We have a very pleasant, roomy house, with plenty of storage space, and the outside grounds and gardens are very well maintained. We feel our house will always be secure when we go away. We cannot think of any negatives. 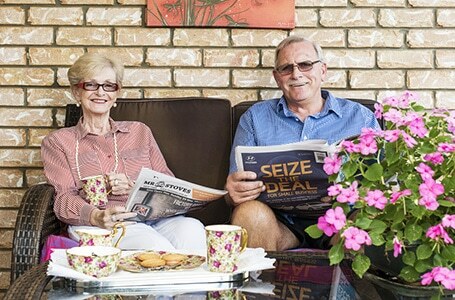 We needed to downsize from a four bedroom Queenslander to something more manageable to help achieve an easier lifestyle – less cleaning, more leisure activities. Mobility – Peace of mind knowing that we can go travelling any time without worrying about our house, mail, garden, etc. Security & Support – Caretaker on site and there are so many residents at home during the day, someone is almost certain to be aware if thieves try to break in to a home. 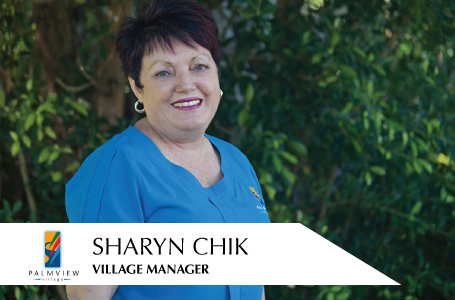 Village Atmosphere – We wanted to live in a community of similarly aged, like minded residents. Location – Proximity to medical and hospital care, shopping centres, clubs and the Gooseponds. 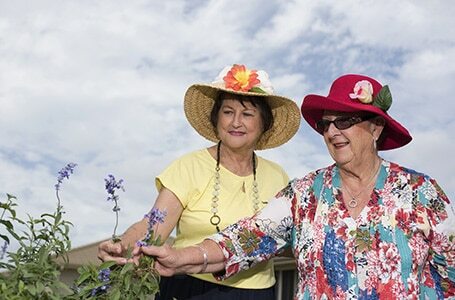 Aspect of Village – Palmview decidedly has the most pleasing aspect of retirement villages in Mackay. The grounds are always neat and tidy with beautiful gardens. The units and recreational facilities are well maintained. Excellent recreational facilities and social activities to occupy us if we want to. The directors and shareholders of Palmview Village Pty Ltd were considered by us to be successful in business and of trustworthy and honourable character. They are also all local people. This assured us of the successful running of the village and its stability into the future. We have been residents at Palmview Village since August 2004. Can we recommend Palmview Retirement Village? We have been very happy and contented here for 12 years now. What originally attracted our interest was the local ownership and the superb location – so close to all the amenities and the magnificent Gooseponds environment. Our accommodation unit house and the village facilities are ideal for our retirement needs. Mowing, maintenance of the gardens and property is excellent. Right from the start management has been so co-operative, supportive and caring for our needs. We have found that to invest in Palmview is to invest in a great lifestyle. There is so much to offer – security, companionship, social and sporting activities. Residents are free to participate as they choose. We hope we will still have many years to enjoy what we now experience at Palmview Retirement Village. The residents, staff and owners are excited that 2016 will see the completion of construction of the village. In our community introductions are easy and we are only too happy to do an obligation free tour of what we have available. Contact Tania or the office today and that step becomes closer to reality. There is a common message that existing residents pass along to any visitors thinking of joining us as Village People… ‘Don’t leave it too late!’. We are always keen to meet any potential new ‘Village People’ so contact us today to be introduced to Palmview Village’s community and resort style environment. You’ll be glad you did but… Don’t leave it too late!